Around here life is tough if you’re a squirrel. Sure, they’re totally cute, jumping around in trees, holding nuts in their little paws and spinning them around to find the right side. And when they bury something they so carefully pat the ground back down to hide it. Who wouldn’t love them all? But they have a nemesis, one who will not stop until they are wiped out. Squirrel-kind call it the Ground Dragon and it kills mercilessly and without cause. Screaming down the grey separators of the forests that the squirrels must cross to find food and shelter they kill without mercy. Since we humans breed the dreaded ground dragon, I figured it was up to us to find a solution to help save the squirrels. Many ideas came and went: teleporters – cool but that whole Heisenberg thing is a real problem, tunnels – flooding and a chance of collapse are just too great, squirrel Uber – this one had merit but not all squirrels get good cell service to arrange a pick-up. I despaired of ever finding a viable solution. Then it hit me. 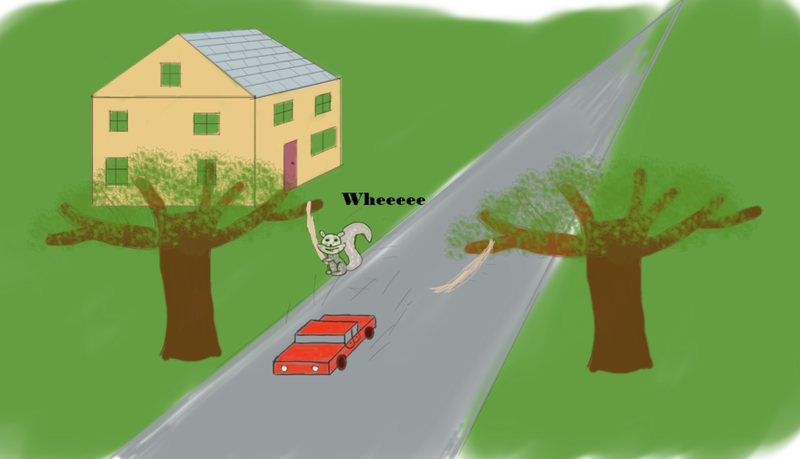 Squirrels are great acrobats, leaping from tree to tree and I’ve even seen them swing. What if we put up Tarzan style ropes and vines across all the roads so they can swing from side to side in total safety. And look cool while doing it. I set up some test areas and found that 75% of the squirrels would use the swings and all of them survived the dangerous street crossing. That was pretty good, I thought. I took my data, videos, photos and some of the more vocal squirrel testers to the local board and asked for a wider implementation. After review, they said that while my plan was good, since it could not save 100% of the rodents in danger, it wasn’t worth it. I pleaded with them saying the 75% was so good and would save a lot. But they wouldn’t budge, it was 100% or nothing. The board was using a nirvana fallacy on me. This isn’t the kind of fallacy that smells like teen spirit but is instead a case where unless perfection is achieved, then no solution is worthwhile. For me, even though 75% of the squirrels was a great number, it wasn’t 100% and therefore was no good. In this fallacy, solutions that are “good enough” are discounted because they do not meet some mythical or idealized goal. There are several reasons for using this fallacy. One is that some solution would cost money or take effort so unless it’s the best, don’t do it even if it would help tremendously. Another is to shut down a competing solution by arguing it doesn’t solve the whole problem, even if the other solution doesn’t either. Some people just want to live in an idealized world and will not accept any solution that doesn’t meet their concept of perfection. The fallacy has appeared in political debates about health care as well. Unless we can find a plan that will work for absolutely everyone, then no plan is good enough. Even though, it’s quite possible many ideas were presented that could have helped a large percentage of the population. Unless a plan could solve every issue present in healthcare then there was no sense hearing them. Since it’s a complex problem, a great many ideas were probably never even entertained. Then there are just those common arguments where one side does not want to give the other any chance to present their ideas. They will come up with a level of perfection that is unattainable to keep the other side from making any kind of counter argument. They might say “The major problem with affordable space flight is the cost per kilogram of getting off the Earth, so unless someone can find a way to make items weightless then there is no reason to invest in space flight.” That’s a preposterous argument as it’s likely impossible to make something have no mass. The opposite of this fallacy is often stated as “Don’t let perfection be the enemy of the good” and it is in plain view when looking at self-driving cars. It’s thought that right now autonomous vehicles could, on average, be 10% safer than human driven cars. Given the number of auto accidents per day 10% is quite a lot. However, self-driving cars are not perfect and will have their own accident rate. Since manufacturers can’t make them perfect they are seen as not a viable alternative. For arguments sake, say they can save 10,000 lives per year but may cause 1,000 deaths. That’s still a net gain of 9,000 lives per year. But until they hit a mythical 0% accident rate their rollout is slowed. Now you know what this fallacy looks like. If you see it, you can argue “good enough” is often just fine in most instances. You can tell someone their idealized goal is unattainable and they need to consider a realistic solution. If nothing is accepted then maybe just walk away from the conversation. Now that we’re done, I have to go see some squirrels about requests for loin cloths. I don't just do woodworking. I'm a data analyst by day and I'm interested in critical thinking, logical fallacies and other skeptical subjects. This blog is a light look at a variety of critical thinking subjects.